the midnight.) I think that the brightness change in the sky is caused together by the　following ①, ②, and ③ effects. ①The effect that a shadow is deepened by the earth turning. 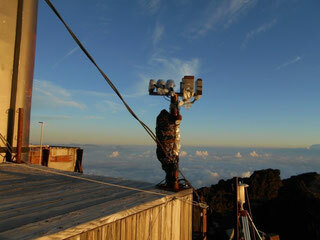 ②The effect that the dropping aerosol transparentize the atmosphere. 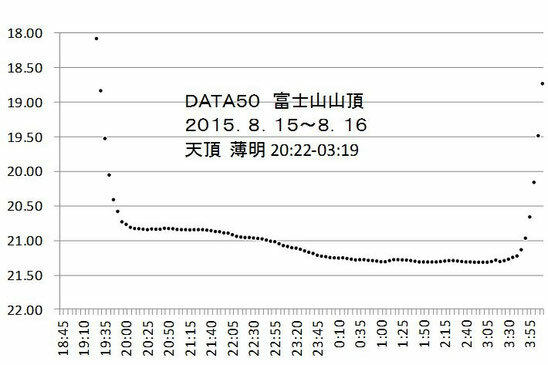 ③The effect that the decrease in the light above the ground decreases the dispersion of light.If this suppositions are right, the darkest time should become near the midnight in the places with little aerosol. I predicted that the above tendency becomes more remarkable in the top of Mt. Fuji where there is little aerosol, and I carried out this observation. The slightly high quality data are provided from the observation made at the night on the 15th of August among the above five observations. It is shown in figure 1. I was not able to observe the state of the real night sky, but I think that it was clear near the neighborhood of zenith in that night.I can suppose it from the fact that bright stars were continually observed with the weather camera com1 and com2 which were installed by the group of the Tokyo Gakugei University and from an observational wave pattern. Vega of Lyra passed the zenith from about 20:00 to about 23:30, and the observational data wil be influenced by this passage.I expected that the darkest time occurs near the midnight on the mountaintop, but the observational data cannot give the results which support or deny this expectation.The results seem to come from the difference in season and do not come from the difference in the quantity of aerosol. Furthermore, I will repeat the observations and increase the data to deepen the investigation, and I think that the observation in the winter is necessary even if the observation is made even at a slightly low altitude. That is all.